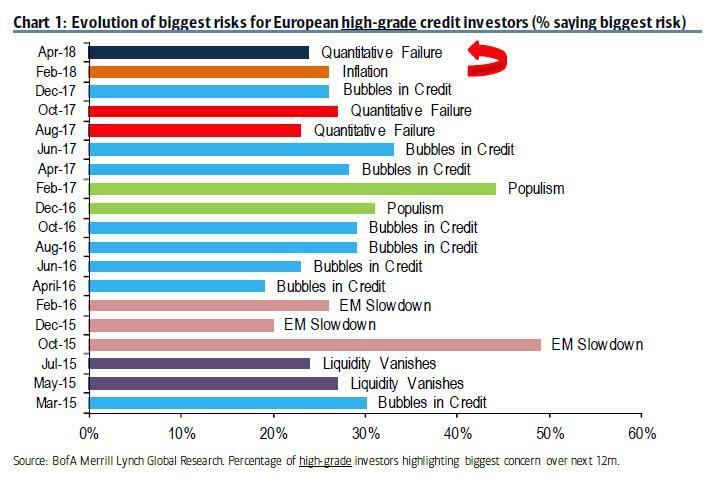 In the latest BofA survey of European fixed income investors (both IG and high yiled), the bank's credit analyst Barnaby Martin writes that "after fretting about inflation at the start of the year, April’s credit survey shows that the biggest concern has reverted back to “Quantitative Failure”, driven by the recent data slowdown." Indeed, as the chart below shows, whereas the evolution of "biggest risks" for Euro investors indicated that strong growth at the start of the year provoked worries over rising inflation, "the recent data moderation has meant that these concerns have quickly given way to worries about a lack of inflation – and thus “Quantitative Failure”." And yes, it took just three months for the market to make a 180 and worry not about inflation, but deflation, and a Fed that may be pursuing too many rate hikes into 2018. As Martin notes, "the speed at which inflation concerns have flipped highlights the slim margin of error for a "goldilocks" economic backdrop in '18." 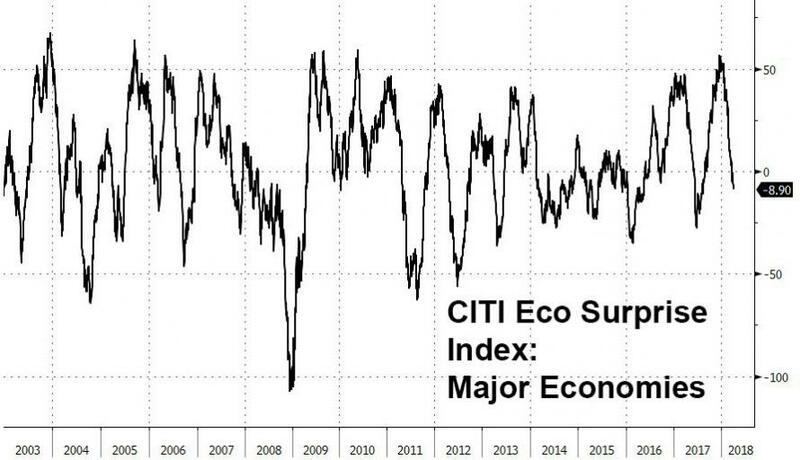 In retrospect, however, the sudden reversal is probably not that much of a surprise: as we showed this morning, according to the Citi G-10 Eco Surprise index, after hitting the highest level since the financial crisis, economic surprises promptly tumbled into the red just three months later, confirming how tenuous and fleeting the so-called "global coordinated economic recovery" had been all along. And yet this sudden reversal puts the Fed and central banks in a major quandary. Recall that in a world with over $200 trillion in debt, amounting to well over 300% of Global GDP, the only saving grace is for the debt to get inflated as the alternative is default, either sovereign or private. But what if inflation does not come? That is the question Martin asks, and provides the following answer: "inflation is a must - the world has never had more debt." Investors worry about a potentially toxic combination of low European inflation at year-end just as the ECB – for political reasons – has to stop adding assets. This is the narrative of “Quantitative Failure”. As Chart 2 shows, the world has never had more debt. In fact, since the Global Financial Crisis, global debt has increased close to $50tr (~40%). Monetary largesse in the aftermath of the crisis was used to kick-start the economy, yet it has also simply added to the world’s debt pile. And how does one solve a problem of too much debt when bond restructurings and haircuts are no longer palatable? Inflation. Which is why "without convincing signs of [inflation] soon, the risk becomes that markets pivot to feeling uneasy about the world’s debt sustainability." Indeed Barnaby, although Goldman is one step ahead of you there. 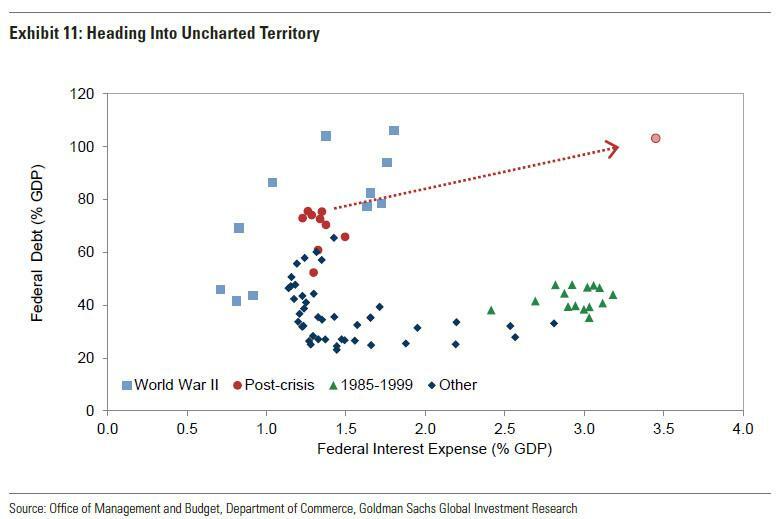 Recall that back in February Goldman's economists observed that "the US appears to be headed into uncharted territory—at least for US fiscal policy—regarding the relationship between interest expense and the debt level." As shown in Exhibit 11, interest expense considerably exceeded the current level during the late 1980s and early 1990s, though the debt level was moderate. By contrast, the debt level was slightly higher during and just after World War II than it is today, while the level of interest expense was similar. However, we project that, if Congress continues to extend existing policies, including the recently enacted tax and spending legislation, federal debt will slightly exceed 100% of GDP and interest expense will rise to around 3.5% of GDP, putting the US in a worse fiscal position than the experience of the 1940s or 1990s. But Goldman's most startling admission, by far, is the following: "the continued growth of public debt raises eventual sustainability questions if left unchecked." The irony, of course, is that while one Goldman employee warned that the US is now on collision course with debt sustainability, it was another former Goldman employee - former COO Gary Cohn - who transformed this blueprint for catastrophe into reality. Needless to say, the culmination and outcome of these processes is a fiscal - and sovereign debt - crisis... unless the Fed proceeds to monetize the deficit once again as it did in 2009-2015, sending yields plunging as the next and final episode of QE is unveiled. Incidentally, the coming debt crisis is also why Cohn - the mastermind who greenlighted it - couldn't wait to get the hell out of Dodge.